Definition at line 141 of file PhiValues.h. Definition at line 192 of file PhiValues.cpp. Definition at line 205 of file PhiValues.cpp. References ID, INITIALIZE_PASS, and llvm::AnalysisUsage::setPreservesAll(). Definition at line 148 of file PhiValues.h. Definition at line 149 of file PhiValues.h. References F, llvm::PhiValues::releaseMemory(), and runOnFunction(). 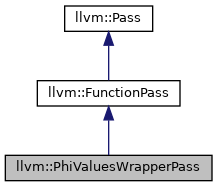 Definition at line 201 of file PhiValues.cpp. 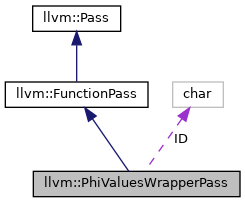 Definition at line 196 of file PhiValues.cpp. Definition at line 145 of file PhiValues.h.